Derived from DHEA – known as the ‘fountain of youth hormone’. For preventing the effects of ageing. Positive effect on weight loss and fat mass reduction. Is not converted into oestrogen or testosterone. 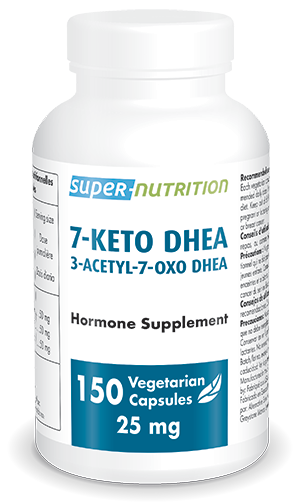 7-Keto™ DHEA (3-acetyl-7-oxo dehydroepiandrosterone or 7-oxo DHEA), commonly known as 7-Keto™, is a natural metabolite of DHEA which can safely stimulate immune function and reduce body fat mass. Unlike DHEA, 7-Keto™ is not converted into oestrogens or progesterone. • Structurally, 7-Keto™ is almost identical to DHEA from which it is derived through a natural process of enzymatic conversion. Levels of 7-Keto™ seem to follow the same pattern over time as those of DHEA: blood concentrations have almost halved by the age of 50. This reduction may be linked to the increases in fat mass and total body weight and impaired immune function seen with advancing age. • 7-Keto™ is significantly more potent than DHEA. At the same dose, it is almost 2.5 times more powerful, and with no side-effects. In fact, 7-Keto™ may actually be responsible for the majority of the benefits attributed to DHEA. It is more effective at improving memory, as well as inducing, boosting or regulating thermogenesis. It has all the advantages and none of the disadvantages of DHEA and is also safer, thus constituting a real alternative to DHEA. • Research into 7-Keto™ has been conducted over the last 10 years or more by Professor Henry A. Lardy and his team at Wisconsin University’s Dept of Biochemistry. He has 9 patents-pending on the applications of 7-Keto™ in strengthening and regulating the immune system, as an aid to treatment of Alzheimer’s disease and in promoting weight loss. • 100 mg of 7-Keto™ taken twice a day, combined with physical exercise and a diet of less than 1800 calories resulted in weight loss of 3kg and a reduction in fat mass of 1.3% over 8 weeks. T3 thyroid activity, a powerful metabolic stimulant, increased significantly. • Studies on 7-Keto™ and weight loss have generally used 100 mg doses taken twice a day. • For anti-aging purposes, 25 to 50 mg a day is generally sufficient for healthy individuals. Higher doses may be considered for limited periods, for the purposes of weight loss, when combined with exercise and nutritional advice. 7-Keto™ should ideally be taken in the morning, with a possible second dose at midday. If taken in the evening, it can stimulate brain activity and may cause insomnia. • There is no build up over time of 7-Keto™ in the body. However, even though it is quickly eliminated from the body, relatively high blood levels are achieved within a short period, enabling the benefits to be felt fairly quickly. • Anyone who takes DHEA - if they are prepared to pay a little more for an even safer, more effective supplement. • Men with excessive testosterone conversion – replacing DHEA with 7-Keto™ DHEA prevents a simultaneous and unwelcome increase in oestradiol. • Anyone who wishes to achieve long-term, effective weight control. • Those for whom DHEA has not worked, or at least not well enough. • 7-Keto™ is neither converted into oestrogen nor progesterone and is significantly safer than DHEA. Doses as high as 500 mg/kg have been given to primates with no harmful side-effects observed. This equates to much higher doses than those recommended for humans. One human toxicity study also showed that a daily dose of 200 mg of 7-Keto™ had no effect on blood or urinary profiles and was very well-tolerated. Each vegetarian capsule contains 25 mg of 3-acetyl-7-OXO-DHEA (7-Keto DHEA). Recommended use: adults. Take one or two vegetarian capsules daily at mealtimes or as recommended. Each vegetarian capsule contains 25 mg of 3-acetyl-7-OXO-DHEA (7-Keto DHEA).